Most often, when people plan for a trip to Spain, their itinerary features Barcelona, Valencia, Madrid and Andalusia region prominently. 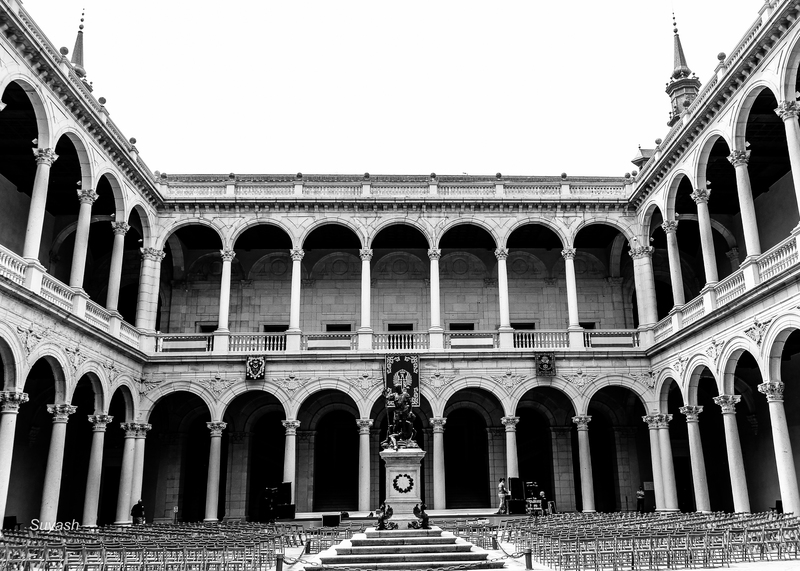 But Spain has so many overlooked gems in its basket of historical and cultural prominence. 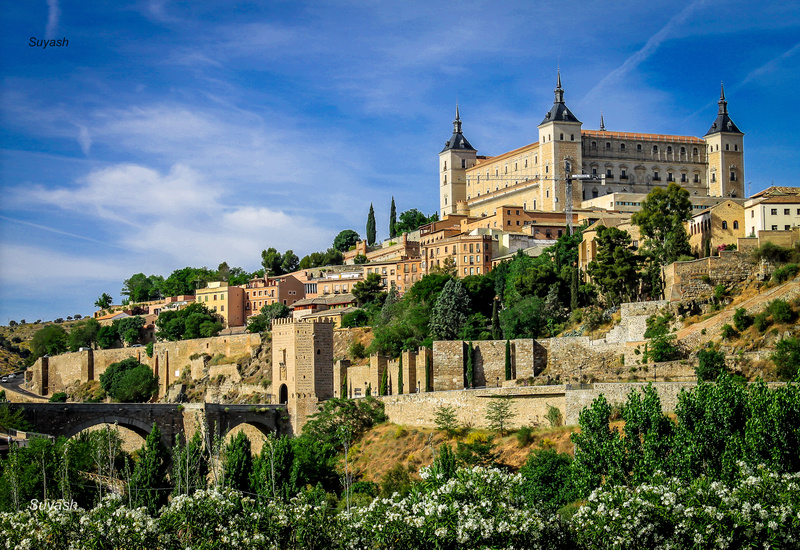 Even if you are on a tight schedule and / or shoe-string budget, you must not miss visiting Toledo, just 70 km south of Madrid. It is generally considered a day-trip but i will strongly recommend spending few days in this erstwhile capital of Spain, owing to the uniqueness and magnanimity of this adoring place. 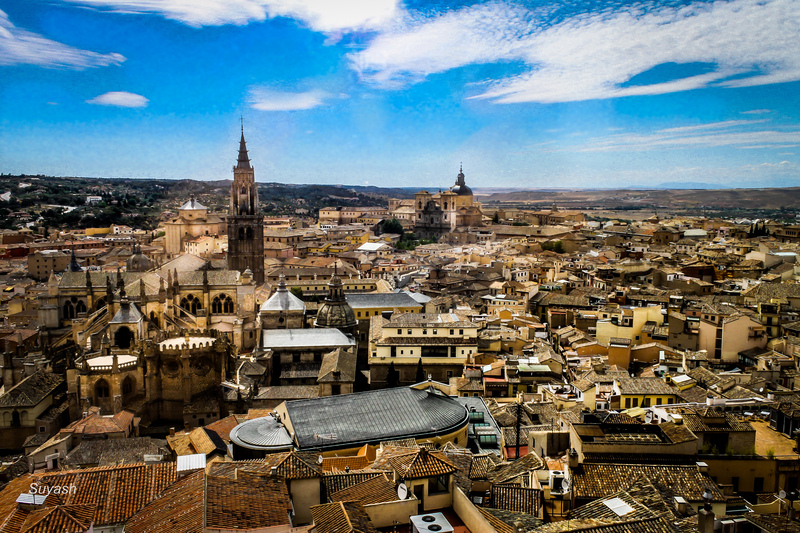 Above photograph of the picturesque, walled city of Toledo in Spain was shot from the top of the stone fortress and palace of Alcazar – the highest point of the city. It provides a magnificent view (and depth of view, too!) of the medieval city with its famous monuments and historic buildings. In this shot, apart from the Cathedral, Churches of Santo Tome and San Roman (at the far end of the photo), located on the west side of the walled city can also be seen. At the present day Alcazar, there stood a Roman palace in the third century. The building that you see today was inspired from the Renaissance style of architecture. Irony of Alcazar is that it was never lived by the Spanish kings, because before the completion of its construction, capital of Spain was moved from Toledo to Madrid. Alcazar stands testimony to the historic Spanish Civil War of 1936. The palace, at a walking distance from Plaza de Zocodover, was renovated in 1940 and today it houses Spain’s official military museum, Museo del Ejercito. Second biggest cathedral of Spain, after the cathedral in Seville is located in Toledo. Built in 13th century, this enormous Cathedral of Saint Mary of Toledo is the most important church in Spain because of its historic and ecclesiastical importance as it has been the residence of high-ranking Catholic Bishops and clergies over the ages. One of the finest cathedrals of Spain with stunning stained glass windows and frescoes is built on top of a Moorish mosque. 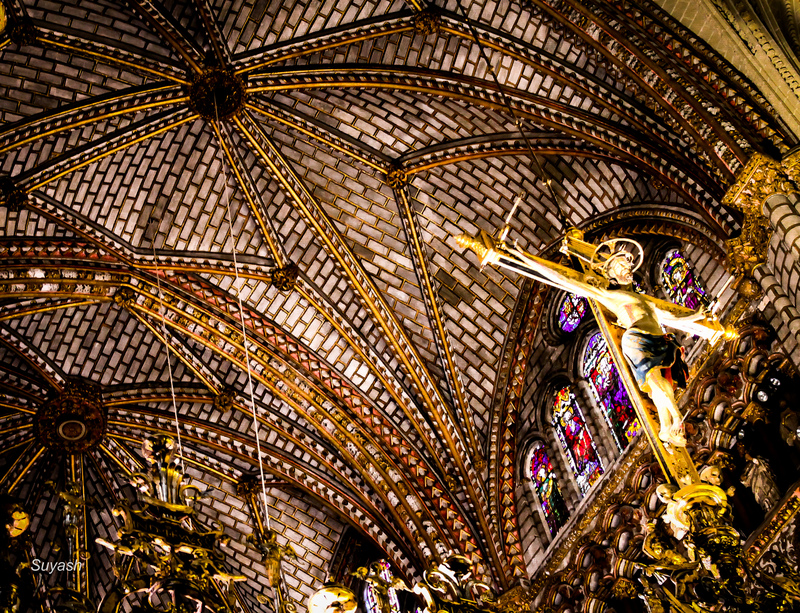 Once inside the Cathedral, you will encounter the Gothic and Renaissance style of artwork. There are huge oil paintings of Toledo Cardinals, painted by the likes of Goya. 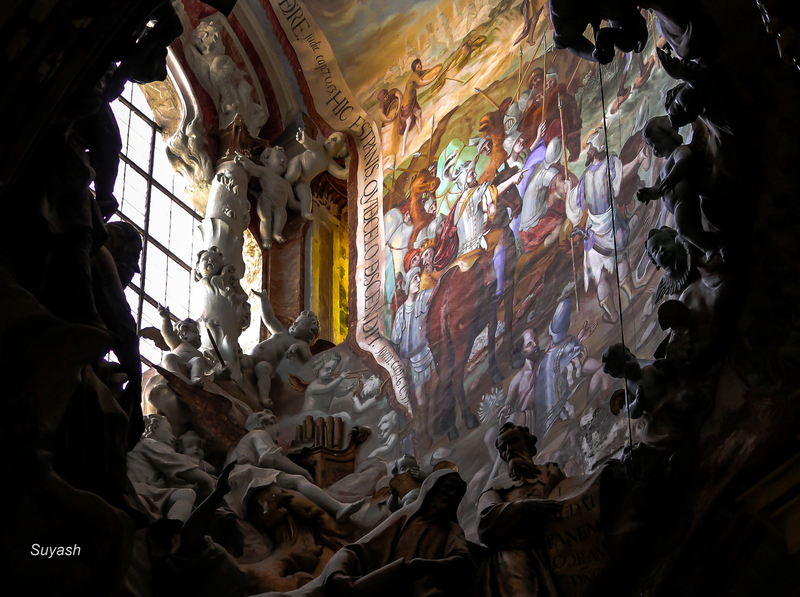 Walls and ceilings of the cathedral are decorated by the frescoes painted by Juan de Borgoña, Lucas Giordano, Francisco Bayeu and Maella. There is an inspiring art gallery also with some masterpieces. Seeing these paintings and art works, i was transported back in time, wondering about the magical time their creators must have had, sitting idyllic in this gem of a city, sitting majestically on a hill. However, there is one thing about Spain, which i completely detest, and can never support. Read here to know what is that. Have you been to Toledo? How was your experience with the history and culture of Spain and Toledo, in particular? Do share with us. This entry was posted in Art & Culture, Photography, Spain, Travel and tagged Alcazar Spain, Alcazar Toledo, Gothic Style, Goya, Madrid, Museo del Ejercito, Plaza de Zocodover Toledo, Renaissance Style, Santo Tome and San Roman Toledo, Spain, Spanish History and Culture, Toledo, Toledo Cathedral, Travel. Bookmark the permalink. I am glad you liked these pictures. 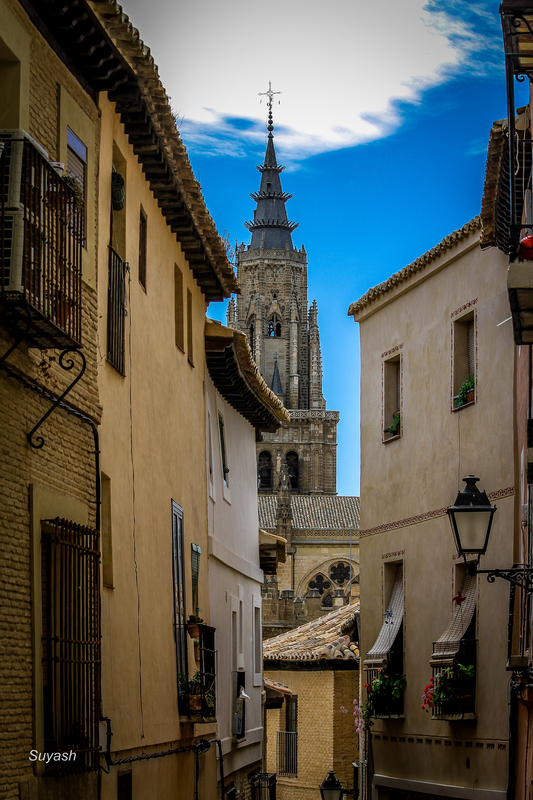 Toledo is a lovely small place, very artistic and picturesque. I would love to visit it again and stay for a longer time period this time. It’s a wonderful experience. I hope you too had fond memories of the place. Right with everything you said – and yes, I had a marvellous time there (and throughout the whole trip through Spain then!). Always good to know like-minded people. Cheers! What a great variety of stunning images !!! Yes Sreejith, Toledo is a very captivating small town. Heaven for photographers i must say. These are gorgeous photos. I particularly like the first two and the second-to-last one. It is hard to create great photos in harsh mid-day sunlight, but you use the contrast to your advantage and the colors really pop. I am going to have to put this place on my travel to-do list! Yes, would love another trip there. Thanks for my recent ‘likes’. thanks for visiting my blog and giving all the likes. You have a very nice blog as well. I will be back to read more, God bless! Wonderful images. Thank you for transporting me to Toledo. Enjoyed the tour and photos showcasing the various places you’ve seen. A worthy entry for the challenge. I liked it very much. Thank you …. In Canada, there is nothing historical standing, that was built before the 1800’s, except for maybe a few military forts. Amazed by these pictures Suyash, and the architecture, such as that cathedral built in the 13th century is stunning. Would be amazing to see it all in real. Beautiful landscape and architecture! The interior of the cathedral is amazing! Thanks for visiting Toledo of Spain, virtually on my blog though. Its a very beautiful place indeed! Toledo is just a 30 min travel on high speed train from Madrid. So, when you plan a trip to Spain, do not miss this. Its an amazing place with so much of experiences to collect by.